Clockwise from lower left : 28mm f/4 Schneider Curtagon with it's integral lens hood : 50mm f/2.8 Schneider Xenar with the bayonet-fit rectangular lens hood which is also suitable for the top centre 35mm f/2.8 Schneider Curtagon shown next to it : top right 135mm f/4 Schneider Tele-Xenar : lower right 50mm f/1.9 Schneider Xenon : centre 85mm f/4 Schneider Tele-Arton. Due to the physical similarity in size between the 35mm, 50mm f/2.8 and 85mm lenses, the former is marked with two rings, the latter with one, for ease of identification. It may be of interest to note that the earlier 50mm f/2.8 Xenars appear to have been available scaled in either feet or metres, whereas the later lenses have a dual scale. This may or may not be true of other lenses as well. The 28mm, the 50mm f/1.9 and the 135mm lenses take "standard" 58mm screw-in filters (which Kodak refer to in their literature as 60mm), on the 28mm these screw into the front of the built-in lens hood. 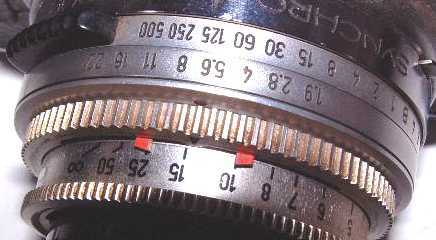 Push-on circular plastic lens hoods were available for the 50mm f/1.9 and the 135mm lenses. 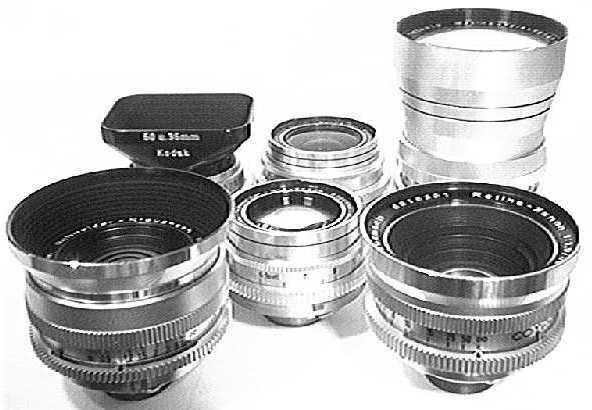 The 35mm, 50mm f/2.8 and the 85mm lenses take the rectangular bayonet-fit plastic lens hood, with an extension for the 85mm lens, and 29.5mm screw-in filters (which Kodak refer to in their literature as 32mm, this is the push-on size). All of these lenses fit and couple to the rangefinder on the Retina IIIS, though the 28mm lens really needs a separate viewfinder on this camera as there are no bright-lines in the viewfinder for it, though the full field of the viewfinder, outside of the 35mm brightlines, does give a good approximation. Also available was a Tele-Xenar 200mm f/4.8 lens, shown above on my Retina Reflex S, supplied in a custom fitted case with a screw-in lens hood and a set of filters that screw onto the back of the lens. These lenses are somewhat scarcer and do not work with the Retina IIIS, as there is no rangefinder coupling. The tripod-mount rotates and is integral to the lens, but not lockable. The minimum focus is 29ft, (about 9 metres), rather more distant than we are used to with modern lenses. Some cameras were available with Rodenstock Ysarex f/2.8 or Heligon f/1.9 50mm lenses as standard. Also available from Rodenstock were Eurygon f/2.8 30mm and f/4 35mm wide-angle lenses and Rotelar f/4 85mm and f/4 135mm telephoto lenses. Unlike the "C"-series Retinas, these lenses are fully interchangeable with the Schneider optics, though they are somewhat scarcer. All of the lenses illustrated above feature red dynamic indicators which move as the aperture is changed to give an instant appraisal of the available depth-of-field, shown here on the 50mm f/2.8 lens mounted on my Retina IIIS. Though this feature would seem to be most useful on the rangefinder camera, as none of the reflex models, including the Instamatic Reflex, have a depth-of-field preview capability, it is quite useful on these as well. 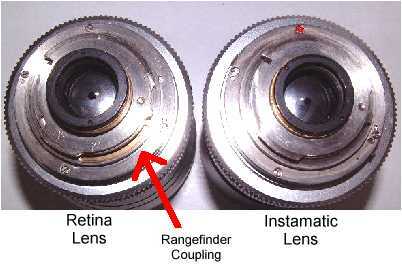 Although the lenses supplied for the Instamatic Reflex do not have this feature, they do have conventional depth-of-field scales. With the introduction of the Instamatic Reflex a 90mm Tele-Arton lens was also announced. This was produced specifically for this camera and does not have the dynamic depth-of-field indicators. Similarly, I have a 50mm f/1.9 lens without these indicators that has a 52mm filter thread and a black and silver 135mm lens the same, rather smaller than the 58mm fitting on the 'S' lenses. There was also a 28mm lens without the indicators or integral lens hood that feature on the 'S'-series 28mm lens, and a black-and-silver 200mm f/4.8 that would seem to date from this period as well. 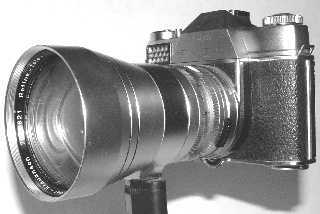 Neither the 45mm f/2.8 Xenar or the 50mm f/1.9 Xenon supplied with the Instamatic Reflex will fit on the Retina IIIS as they do not have the rangefinder coupling, though they do fit the Retina Reflex S, III & IV cameras. This is also true for the 90mm Tele-Arton and the black and silver 135mm Tele-Xenar. The 45mm, 90mm and the 135mm lenses are mentioned on Schneider's Website as being designed for a 28mm square negative, so one may have anticipated some vignetting if used for 35mm format, though comparative tests performed by B.W. Freyburger show no such problem. One may also care to note that the lenses introduced with the Instamatic Reflex are no longer designated "Retina" on the front.